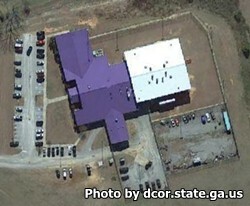 Jefferson County Correctional Institution is located in Louisville Georgia. It is a medium level facility that houses 190 adult male offenders who have been convicted of both felonies and misdemeanors. Inmates are housed in eight separate dormitories. Eligible offenders can work outside of the institution on work crews that work at the landfill, waste management, construction and county maintenance. Vocational opportunities at Jefferson County Correctional Institution include masonry, welding, heavy equipment operation, and plumbing. The Chaplains office gives inmates worship and prayer services, bible study and even manages an inmate choir. Offenders can earn their GED and receive counseling for a range of issues including substance abuse. The visiting hours for this correctional facility are currently unknown, please contact the institution for more details. If you know the visiting hours, please leave a comment below.